Another beautiful cabin rental at Starr Crest Resorts is pictured to the right and is known as Majestic Mountain Lodge. And as you can see by the photo of the master bedroom, you will be pampered in luxury by it's beautiful decor and amenities. Majestic Mountain Lodge at Starr Crest Resort is a 4 bedroom 4 and 1/2 bathroom vacation cabin in the Smokies that features so many games and fun activities in it's game room that you may never want to leave the cabin. But of course that would be a big mistake because the Smoky Mountains are an incredible place to see and experience. There is so much to do here from visiting the towns around The Smoky Mountain National Park like Gatlinburg, Townsend, Pigeon Forge and others to actually getting back to nature and spending some time in the most popular National Park on the west side of the Mississippi. While you are in the park you can hike up to Chimney Tops and get one of the best views available in the Smokies. The hike is a 4 mile round trip that offers a fairly steep uphill grade in on the last 50 yards. Make it a point to go that extra 50 yards because the view is well worth the effort. Now let's get back to the Majestic Mountain Lodge and explore some of the many amenities that will make your next Gatlinburg vacation one to remember for many years to come. Remember that game room I was telling you about? Well it is stocked with all of the most popular accessories and games that you will never run out of something to do. The game room comes complete with a pool table, air hockey table, foosball table, a game table for cards and other board games, a Pachislo machine (I don't know what that is, but it looks cool), electronic dartboard, arcade basketball hoops, arcade video games, a Karaoke machine, a popcorn machine tons of board games and I'm sure there are a few things I've left out. Other amenities include multiple TV's including a big screen TV, a gas fireplace, beautiful mountain views from the wrap around decks and the inside of the cabin, 2 Jacuzzis and a hot tub, a charcoal grill, a hammock on one of the decks, a large kitchen with everything you need to prepare meals and oh so much more. Majestic Mountain Lodge from Starr Crest Resorts can sleep up to 16 people and is well suited for a family reunion, a small church or youth group or a getaway if you just have a large family. 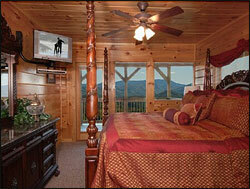 Come spend your next vacation in the Smokies and enjoy this beautiful cabin rental. You are sure to enjoy staying here. This 4 bed 4.5 bath Smoky Mountain cabin rents for between $319 to $499 per night depending on the holidays, seasons and availability. Enjoy your next vacation in the Great Smoky Mountains.